Bella Ceramic 10.5'' X 20'' 1500 Watt Powerful Non-skid Feet Scratch-resistant Ceramic Non-stick Coating Durable Electric Griddle by Bella at Baking Love. MPN: 1. Hurry! Limited time offer. Offer valid only while supplies last. 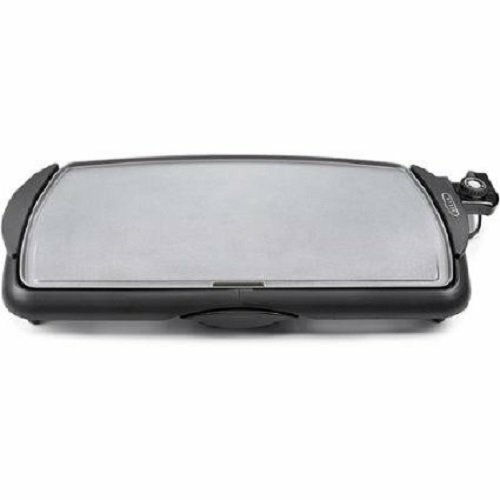 The BELLA Ceramic 10.5x 20 Griddle has a unique ceramic non-stick coating that is BPA-free, PTFE-free and PFOA-free for healthier meal preparations. The BELLA Ceramic 10.5x 20 Griddle has a unique ceramic non-stick coating that is BPA-free, PTFE-free and PFOA-free for healthier meal preparations. This scratch-free coating is 5 times more durable and cooks up to 20% faster than the standard non-stick coatings. Perfect for cooking family breakfasts, but why stop there? Make your favorite appetizers, dumplings, shrimp and even veggies, then remove the probe and serve them right from the Griddle. The easy release feature of the ceramic coating properties allows for no fuss cooking and clean-up is just a quick wipe away.? ?